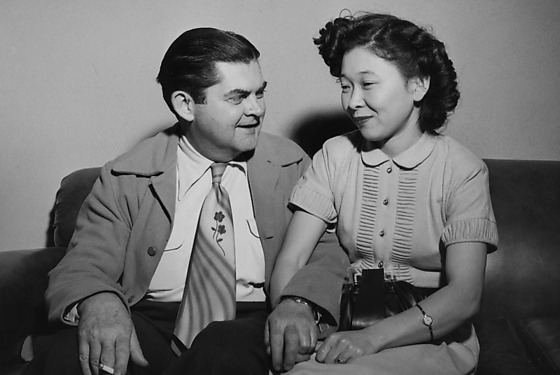 Informal portrait of a engaged couple, Maury Allen Carlton and his blind Japanese fiance, Mae Chieko Kumashiro, sitting on a couch holding hands, Los Angeles, California, November 27, 1951. Dressed in a jacket and striped necktie with floral design, Carlton holds a cigarette in proper right hand while holding fiance's hand in other. Kumashiro sits at right in pleated blouse and skirt, holding a handbag in her lap. Typed on original negative envelope: M. Carlton & Blind Japanese Fiance.